Former Montgomery County Councilmember Valerie Ervin is already canvassing support for the expected vacancy in the State Senate when Eighth Congressional District Democratic Nominee Jamie Raskin wins election to the U.S. House. Ervin represented District 5 on the County Council from 2006 until she stepped down in 2014. She served on the Board of Education for two years prior to winning her Council seat. After leaving public office, Ervin served as the Director of the Center for Working Families and then the National Participatory Democracy Project. Though Ervin worked most recently for progressive causes, she had excellent ties with the business community during her time on the Council. Earlier this year, she briefly sought the Democratic nomination for the Eighth Congressional District but abandoned the race due to fundraising difficulties. Despite this setback, Ervin will be a formidable candidate. In the Washington Post, Ervin expressed her frustration at Donna Edwards’s defeat and her strong belief that the party needs more diverse candidates. Ironically, for the Maryland Senate, this may not be the best comparison as black men are much more underrepresented than black women. Six of the nine of African-American senators are women, so black women are 12.7% of the Senate membership, as compared to 15.8% of the population – a gap of 3.1%. In contrast, black men comprise 6.4% of the Senate, less than one-half their share of Maryland’s population. A more advantageous comparison for Ervin is within Montgomery County, which has no African-American senators, though blacks are 18.8% of the population. Three of Montgomery’s eight senators are women – a decline of one from after the election due to the replacement of Karen Montgomery by Craig Zucker. Regardless, as likely the most experienced politician by far to seek the vacancy, Ervin would bring much more to the race than her race or gender, though both would be assets to a Democratic Party seeking more diversity in its legislative delegation. In the wake of Edwards’s defeat, Ervin has been hesitant to support Democratic U.S. Senate Nominee Chris Van Hollen. This may just be an election night reaction after a tough loss but she’d do herself a lot of good with the Montgomery County Democratic Central Committee, which will fill any vacancy, if she’d endorse him quickly. “Black women are the bedrock of the party, and yet Edwards’s loss is a sign that they still don’t have a place at the table” was the subhead of the The Nation‘s article delving into Donna Edwards’s loss. Yet, rather than providing good analysis, the article desperately works to make facts fit its narrative. The racial statistics alone show its bedrock problems. Nowhere does the article mention that African Americans formed the largest share of Democratic primary voters — 48% compared to just 42% of whites according to the Washington Post. So this clearly was not just a case of the white majority shutting out the black minority, since there was no white majority. What happened? The article mentions but elides over that Chris Van Hollen’s share of the black vote, 37%, was about twice as high as the 19% of the white vote won by Edwards. Van Hollen had a 53 point (72-19) margin among whites while Edwards had just a 20 point margin (57-37) among blacks. Chris Van Hollen won convincingly in large part because he worked for and won a sizeable minority of African-American votes. White candidates fighting hard for and winning over African-American votes is not exactly something to lament. Van Hollen also won women (53-39) by virtually the same margin as men (54-37), so the gender explanation carries even less weight. The other major trope of the article beyond racial dynamics is that Maryland’s political “machine” was stacked against the Edwards campaign, and this is emblematic of the general opposition of it to the elevation of black women. Meanwhile, Baltimore Democrats nominated African-American State Sen. Catherine Pugh for the mayor’s office. I would call this a breakthrough except its not. Future Mayor Pugh will succeed a black woman who succeeded another black woman. One can hardly call this a victory by Pugh against the establishment. Pugh’s colleagues in the State Senate lined up to write her $1000 checks for her mayoral bid. By the way, the State’s Attorney and two-thirds of Baltimore City’s State Senators are also black women. Marylanders do not find this either weird or novel. The Nation deplores that Edwards didn’t win most Maryland establishment support, black or white. They’re correct there. Heavy-hitter Rep. Elijah Cummings sat this one out and Prince George’s County Executive Rushern Baker endorsed her opponent. So did former Maryland Democratic Party Chair Yvette Lewis and Montgomery County Executive Ike Leggett. Perhaps we could avoid rushing to call all of these people machine politicians, sell outs (or worse), just as I would hope that one would avoid doing the same for the prominent white endorsers of Donna Edwards, such as former Montgomery County Executive Doug Duncan and Sen. Karen Montgomery. The insider-outsider label is an interesting one and a matter of perspective. Edwards has served for four terms in Congress representing suburban DC. She received millions and millions of dollars of support from large donors via EMILY’s List. The Nation leaves unmentioned that Donna Edwards originally won her first unquestionably outsider campaign because of support from white progressives. In both of her first two elections for Congress – the one where she nearly beat centrist, establishment Rep. Al Wynn and the one where she did – Edwards did massively better in the white than the black portion of her district. So much for the invincible machine or hostility of white progressives. Virtually all of the white Democratic establishment also lined up behind soon-to-be Rep. Anthony Brown’s unsuccessful gubernatorial bid. Brown defeated sitting Attorney General Doug Gansler and progressive Del. Heather Mizeur, who The Nation accuses of fomenting racial slurs for stating that Van Hollen’s office provides far superior constituency service to Edwards’s. Donna Edwards rightly pointed out the obvious desirability for more diversity in the Senate. Frankly, I’d be surprised if Maryland does not elect an African American to statewide office soon (not counting the Lt. Gov with no disrespect meant to the current or previous incumbents who were elected on tickets). But the narrative that Donna Edwards lost simply because Maryland whites or political establishment just couldn’t cope is too facile. The Nation grudgingly concedes Van Hollen is “nearly as progressive” albeit “not quite” as Edwards. The attempt to turn tiny differences into an ideological canyon failed. Moreover, like so many this year, Edwards tried to turn her isolation from other politicians into a virtue and Van Hollen’s connections into a vice. Except that Van Hollen argued convincingly that progress only gets made by working with others, using his legislative record and firm stand for liberal values to back it up. Anyone less talented or respected than Chris Van Hollen probably would have lost to Donna Edwards, who is engaging and formidable on the stump and had strong financial backing. I don’t blame Donna Edwards and her supporters for feeling the loss. It didn’t happen this time. But, despite the Nation‘s near despondency, all is far from politically lost for progressive African-American women in Maryland even if Donna Edwards didn’t make it this time. I have no doubt that her supporters – and many of Van Hollen’s – will use that energy to win the next one. The breadth of Hillary Clinton‘s victory is hard to overstate. She won all but three very Republican counties. She lost tiny Garrett by 119 votes (6%), Allegheny by 158 (3%), and Carroll by 170 (1%). The other jurisdictions went Clinton, including Montgomery (67%), Prince George’s (74%), and Baltimore City (65%). Sanders won millennials but there just weren’t that many of them–over 45 voters were two-thirds of the electorate and 74% voted for Clinton. Women composed a staggering 61% of Democratic primary voters and 68% voted Clinton. African-American voters were 46% of primary voters and went 75% for Clinton, though she also carried white voters by 52-42. Edwards won only three jurisdictions: Baltimore City, Charles and Prince George’s. 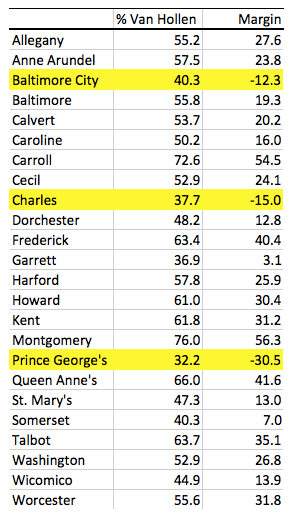 Even in her home base of heavily African-American Prince George’s, Van Hollen managed to win close to one-third of the vote. One source reports that this is because Van Hollen had volunteers all over Prince George’s while Edwards was less well organized. Montgomery delivered well for its favorite son, delivering him 76% of the vote. For more on why I think the Edwards campaign fell short, see yesterday’s pre-game post. After sweating out the returns, Jamie Raskin emerged the winner despite spending less than Trone or Matthews. There still remain quite a few absentee ballots outstanding but Raskin’s lead is too large for Trone to make up despite his strong program to secure absentee votes. Raskin ran and won as a progressive. Indeed, he won because he was a strong and passionate liberal advocate, attracting strong grassroots support for his campaign that stood him in good stead against candidates with far better funding. David Trone spent over $12 million and came in second, edging out Kathleen Matthews. While many might comfort themselves with a strong finish, Trone strikes me as a guy who plays to win and didn’t spend all that money to be the runner up. At least he knows where to go to drown his sorrows. EMILY’s List poured millions and millions of dollars to elect Donna Edwards to the Senate and Kathleen Matthews to the House. Despite both being strong candidates, neither won. Donna Edwards managed to convince a court to extend voting by one hour in four Baltimore locations due to issues, so no votes until 9pm. Can we all wait five more minutes? Sanders devotees will point to his incredibly strong numbers among millennials, though they are lower than the stunning 85% and 90% that he managed to post elsewhere. But there just aren’t that many of them. Millennials composed just 12% of the Democratic primary electorate. Older voters participate far more. People 45 and older formed 65% of Democratic primary. Clinton advocates will argue that this undercuts Sanders’s argument that he brings in tons of young voters. Oh, and Hillary just won Pennsylvania. For all of the talk of Sanders being the heart candidate and Clinton the head candidate, 53% of Marylanders said that Clinton “is more inspiring about the country’s future.” She also won 96% of the people who thought her more inspiring but Sanders won only 78% of those who picked him. Sanders has usually swept independents by a huge amount. In Maryland, Democratic primary voters who view themselves as independent voted only 54-39 for Sanders. In contrast, Clinton won the 81% of Democratic primary voters who saw themselves as Democrats by 67-32. Trump too usually does better among independents. Not in Maryland. Trump won 55% of Republican primary voters who identify as Republicans compared to just 44% of those who see themselves as independents. Among the 36% of Republican primary voters who are white evangelical or born-again Christians, Trump won with 52% compared to just 24% for supposed evangelical heart throb Ted Cruz. Even Kasich managed 22% of white evangelicals. Trump did only one point better among other Republican voters. Stick a fork in Cruz, he’s done?